Save time, paper and glue from a traditional cut 'n paste matching activity! 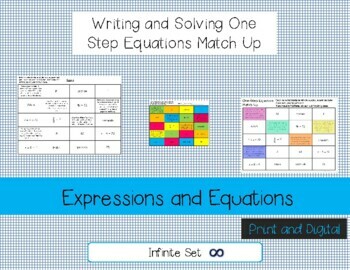 Students will match a verbal description with the correct equation, answer and label. They can shade or use a symbol or drawing like a star or smiley face to match all four boxes together. There are 5 different sets of problems with 4 matching pieces each. 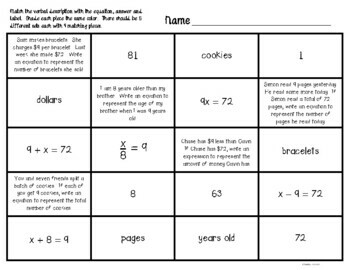 This activity help encourage students to identify the variable in a word problem and label their final answer! 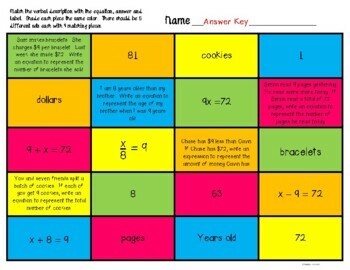 Helps students check and see if their answer makes sense in the context of the problem! 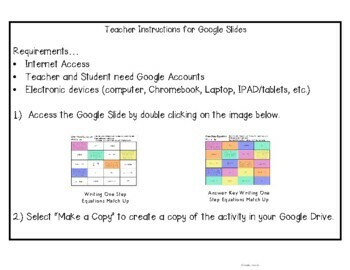 Can be used in partners or as independent work. Great sub activity! Self checking.